Check out the ErgoDeck Colors In Stock! Ergonomic flooring and matting that helps standing workers improve performance and fight fatigue. ErgoDeck MAX Diamond-Plate and Geometric design! You won't find a better anti-fatigue solution. Learn what's under the surface in this NEW Wearwell Video! Click Here & Get Your Copy Today! Ergodeck Protect any size workspace with this modular flooring system. Diamond-Plate Stand stronger longer on the #1 selling industrial mat in the world. 24/Seven Gain traction in grease and oil and with interlocking mats. Rover Stand, lay, or kneel using Rover’s built-in head and back support. Vitality Experience the best in durability, ergonomics, and good looks. F.I.T. Create any size or shape with this lightweight interlocking system. Tile-Top An easy to clean, anti-bacterial mat for hospitals and pharmacies. ElevateElevate your employees. AFR (Animal Fat Resistant) an ecomonimcal choice for food production. Ergonomic flooring products maximize your team's productivity. Tried and true products designed to solve industry specific challenges. A family owned US manufacturer since 1950. 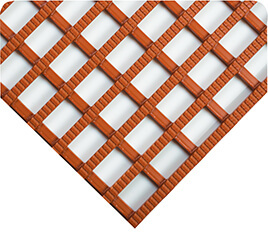 Cutting-edge materials outlast conventional matting products. Custom cuts and shapes create a safe, ergonomic surface over concrete. Meet your safety, productivity and budgetary goals with an onsite assessment. Zone-to-zone defense against slip, trips, falls and fatigue. Designs that provide positive lock connections and lay-flat products.